Will the world suffer a lithium crisis? The foreseeable surge in demand for batteries in electric cars raises the following question: will global lithium production keep up with global demand? The penetration rate of electric cars in the world, which is currently less than 1%, should reach at least 8%, and up to 25%, in 2025. What about supply? Will the production of lithium satisfy the surge in demand? Technically, there are no obstacles. As for market conditions, and thus prices, it’s another story. The main producers are in Chile and Australia. Only the latter should expand its production, followed by minor players. It also happens that Australian production costs are higher. This dual production encourages high prices, as does the potential significant gap between a demand over 800 kt and a production that will hardly exceed 700 kt. The price of lithium carbonate was $6,000/t in June 2015 and reached $20,000/t in April 2016. After decreasing to $14-15,000/t in 2017, it increased again to over $20,000/t at the end of 2017. If the lithium market follows the “platinum” model, prices could remain high before decreasing after 2020. But other scenarios suggest persistent tensions. Recycling might be part of the solution, as well as a profitable business. In 2017, electric vehicles (EVs) account for less than 1% of the global automotive market, yet their batteries already use almost a quarter of the 2016 lithium production. With a 100% market share, EVs would consume the equivalent of 20 times the world’s current annual production. Rest assured, the Earth’s crust is not short of lithium. But this resource still needs to be extracted. The abundance of oil was never a safeguard against the emergence of temporary, nor indeed ongoing, crises. In the case of lithium, there are still many unknowns. We do not yet know the magnitude of the “electric engine” epidemic, although we can be pretty sure it will be huge. Nor do we know the propagation speed of this epidemic, although we can guess it will be fast. Will the production of lithium satisfy the surge in demand? Is there a lithium crisis looming? The future sales volume of electric cars equipped with lithium batteries is still unknown: the compound annual growth rate (CAGR i.e. the average growth rate over several years) varies between 17% and 40% depending on the aggressiveness of the scenarios considered. That is to say, taking into account the rate of car renewal and the number of first-time buyers (especially in Asia and more specifically in China), the penetration rate of electric cars in the world, which is currently less than 1%, should reach at least 8%, and perhaps even 25%, in 2025. This growth will depend on various factors, for example tax incentives, but especially on the cost of batteries, which today accounts for one third of the final price of an electric car. Car manufacturers consider that to make the cars attractive, this cost must be halved, to $100/KWh, while gaining endurance, i.e. KWh, weight, and therefore lithium. The unit quantities used will increase (+20% on average): today, a 100% electric car averages 15 to 20 kWh. This will increase to 50 kWh. Tesla electric cars have already evolved from 60 kWh to 100 kWh. The differences between scenarios are a huge challenge, given the implications in terms of material consumption of lithium or cobalt. The volumes involved are considerable. The weight of a battery is 50 kg for a hybrid vehicle, but ranges from 250 to 500 kg for 100% electric vehicles. And lithium is not the only material concerned. Other metals (aluminum, copper, nickel, zinc, tin, antimony, cobalt, rare earths, and other strategic and critical metals) will also benefit from this increase in consumption related to electric cars. So why focus on lithium? For its performance: of all the metals used in electrochemistry, lithium produces the best pair (energy density, weight). A cobalt Li-ion battery stores twice as much energy as a nickel-based battery and four times as much as a lead-acid battery. 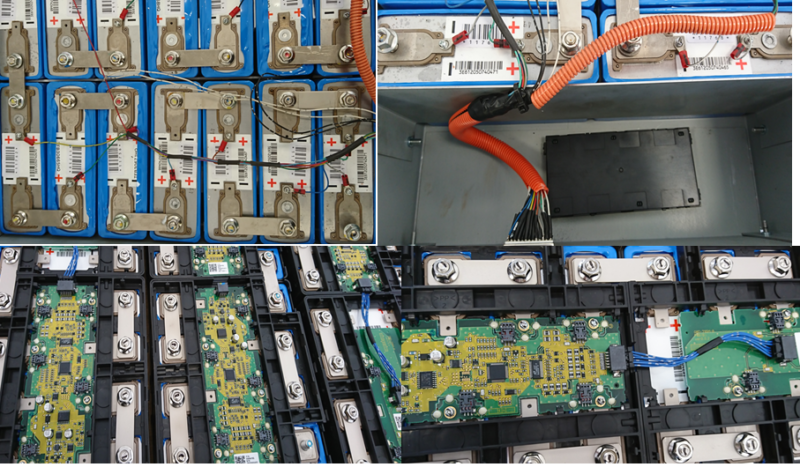 A good battery has a high capacity, a long cycle length (charge – discharge), good thermal stability, and does not degrade quickly – all for a reasonable price. These different parameters govern the different cocktails combining lithium, cobalt, manganese, iron and nickel. Let us simplify to the extreme: in a Li Ni Ma Co battery, nickel brings energy density but less power and greater thermal instability; to circumvent these hazards, manganese increases (mainly) thermal stability; meanwhile, cobalt increases power and life cycle. Can lithium be replaced? In absolute terms, yes. Tesla has announced the release of Ryden Dual Carbon batteries, which contain no heavy metals. In 2016, Stanford announced the development of durable batteries without lithium. Other possibilities include carbon nanotubes and graphene batteries from the Spanish group Graphenano, or sodium-ion batteries developed in France by the CNRS and the CEA. However, these innovations have yet to enter industrial production, and lithium remains at the heart of manufacturers’ strategies today. The rise of electric mobility should therefore have a very strong impact on lithium demand. A quick calculation suggests that the automotive sector will account for at least half of lithium consumption in five years, compared to approximately 20% today. We will now look into the details, based on the 2016 figures, and extrapolate based on several scenarios. The unit is the kiloton of Lithium Carbonate Equivalent (LCE: it takes 5.3 kg of lithium carbonate to obtain 1 kg of lithium). For the sake of simplicity, we will reason based on constant figures regarding other industrial uses and ignore the possible, and highly probable, growth in lithium demand for stationary batteries associated with intermittent electricity generation, whether residential or industrial. Three scenarios are considered: a CAGR of electric vehicles (EVs) of 8%, 13% or 25%. These are reasonable scenarios given the history of energy transitions, whether from wood to steam, or from horse to car. They incorporate two sensitive elements: a doubling of the average weight of a battery (with the rise of all-electric vehicles) and, thanks to technological progress, a non-linear increase in the weight of lithium per kg of battery. Note: maintaining high prices may result in substitutions for other industrial uses. However, the key lies elsewhere: with a CAGR of 25%, in 2025, EVs alone would account for more than five times the 2016 demand. Lithium mining production is therefore expected to increase from 260% to 600% in 10 years. Will the offer be up to the mark? In 2016, approximately 215 kt LCE were produced. Unlike cobalt, for which over half of world production comes from one country (the DRC), lithium is present everywhere on the planet. However, its large-scale extraction is properly achieved in only a few countries. Chile was still the world’s largest producer in 2016 with 37%, followed by Australia with 34%. The latter will exceed the former by the end of 2017. In 2025, if approximately 30% of mining projects come to term (a reasonable figure in this sector), 700 kt LCE will be produced. 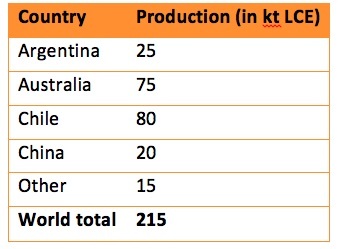 Australia will supply 45% of world production at this time; Chile and Argentina will each supply 15%, China 10%, and the rest of the world (Mexico, the US, Finland, Canada, Zimbabwe, Brazil, etc.) 15%. Production methods will also evolve. In 2016, most production (70%) came from salt pans, i.e. salty lakes of the Andean highlands. This is an inexpensive production method: brine evaporates and the harvest takes place. But Chile is not increasing its production, mainly for political and administrative reasons. It benefits from rising prices and earns very high margins, as its production cost is much lower than that of Australian spodumene mines. Australia, for its part, operates Lithium mines (a much more expensive process), and will be strengthened in its role as a producer whose marginal production cost will determine the world market price. This dual production encourages high prices, as does the potential significant gap between a demand over 800 kt and a production that will hardly exceed 700 kt. The price of lithium carbonate was $6,000/t in June 2015 and reached $20,000/t in April 2016. After decreasing to $14-15,000/t in 2017, it increased again to over $20,000/t at the end of 2017. Cobalt prices have already increased three-fold over the last 18 months. This rise in production triggered investment and lithium prices are expected to drop from 2020. This is a well-known mechanism in the commodities market: high prices trigger investments (prospecting, exploitation) and when these produce their effects, prices fall. However, in the case of lithium, which joins the small circle of essential strategic commodities in a world increasingly dependent on electricity, other evolutions are still unknown. For example, there is the possibility of an oil shock creating a demand shock. If the Iran-Saudi Arabia cold war escalates, will it become a “black swan”: an unlikely event that will cause a new oil crisis and the exponential increase of electric cars in 10 to 15 years? Moreover, what will happen with future demand concerning stationary batteries linked to the rise of intermittent renewables (solar, wind)? With the energy transition, “on demand” electricity associated with gas, coal, and nuclear power generation will gradually be replaced by less regular production, which requires the development of new solutions. 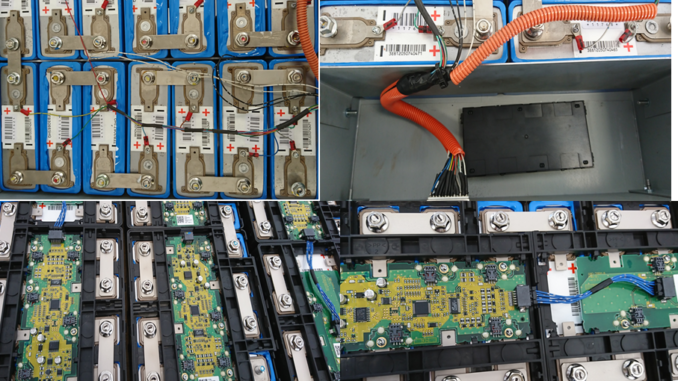 These will be partly software (Linky smart meter) and partly hardware (infrastructure and new gas plants, but also stationary battery storage). Will these storage solutions use lithium? This is the case for those developed by Tesla. Other solutions will undoubtedly emerge, but how fast? Between the reasonable extrapolations of supply and demand associated with the foreseeable development of electric mobility on the one hand, and the hazards mentioned above on the other, it is clear that the market will remain under great pressure for a decade or more. We can try to model its evolution based on the example of platinum, which has also experienced a spectacular rise following the gradual adoption of catalytic converters in the United States, Japan, Europe and the rest of the world – yet another development associated with the automotive industry! In 2002, its price was $400 per ton; it rose to $2,000 in 2008 (as a result of the adoption of catalytic converters, but also because of the global rise of raw materials). After a sharp fall with the financial crisis, it rose very quickly to 1,800 dollars and gradually decreased to 1,000 dollars in 2017. Apart from the 2008 episode, there are no spectacular jolts, which would reflect stop-and-go investments. After fifteen years, the price is still 2.5 times higher than it was in the starting situation. Let us note, however, that the adoption of catalytic converters was gradual. The increase in the consumption of platinoids has therefore been steady. In contrast, for electric vehicles, the urgency of the climate crisis regularly reiterated by globalized ecology imposes abrupt, mass global change, as quickly as possible. This model is not predictive, but the sequence of events gives an idea of ​​the likely future of the lithium market. I draw two conclusions. The first concerns the industrial availability of lithium. Although we should expect competition for resources, the fear of a sudden shortage is perhaps excessive, as long as demand does not rocket. Given the economic specialization of the main producers (Chile and Australia) and their integration in global trade, it is possible to discard the prospect of a single actor capturing all the resources in a logic of vertical integration, as seen with China’s strategy concerning rare earths (however, Chinese companies have positioned themselves on the lithium and cobalt production segments). Lithium will therefore remain available to all those willing to pay a price. The solution still lies, and will remain, in the commitment of R&D to inventing substitution processes, all drawing on basic research. Second conclusion: battery recycling will probably be one of the solutions. It is a cost-effective way of bridging the gap between demand and primary supply by 2025. SNAM, a company from Aveyron, France, is a world leader in this field. Another element reinforces this: lithium, beyond its thermal fragility and its explosiveness, will be considered toxic, and as its usage grows, the regulations will most certainly become tougher. Recycling has a cost, of course, but the development of more efficient processes could enable the development of sustainable industrial specialisms. Moreover, it will create resource availability in the consumer countries. The energy transition towards all-electric is underway. This is a world event, which will be compared in the future to the taming of fire, the advent of steam, or the harnessing of hydrocarbons. Storing electricity in lithium-based processes is only the first step. Other forms of storage as well as other energy processes (ITER) will emerge. The solution still lies and will remain in R&D, intelligence and a certain degree of randomness in basic research and science.